Irish Fans Parking Only is the message on this metal sign. This Irish parking sign is a colorful design that features the fighting Irish leprechaun along with the ND logo. 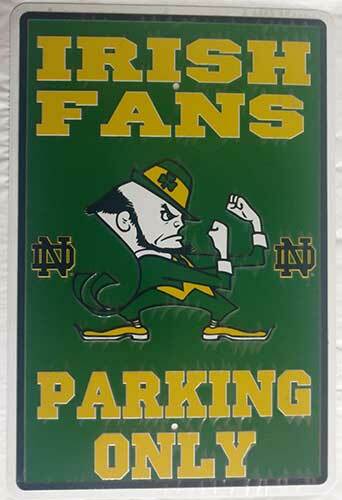 The Irish fans parking sign is a metal design that measures 12" wide x 18" tall. The metal ND parking sign is ready to hang and it is complete with a shamrock history card, complements of The Irish Gift House.